These settings control how email is sent to your customers. 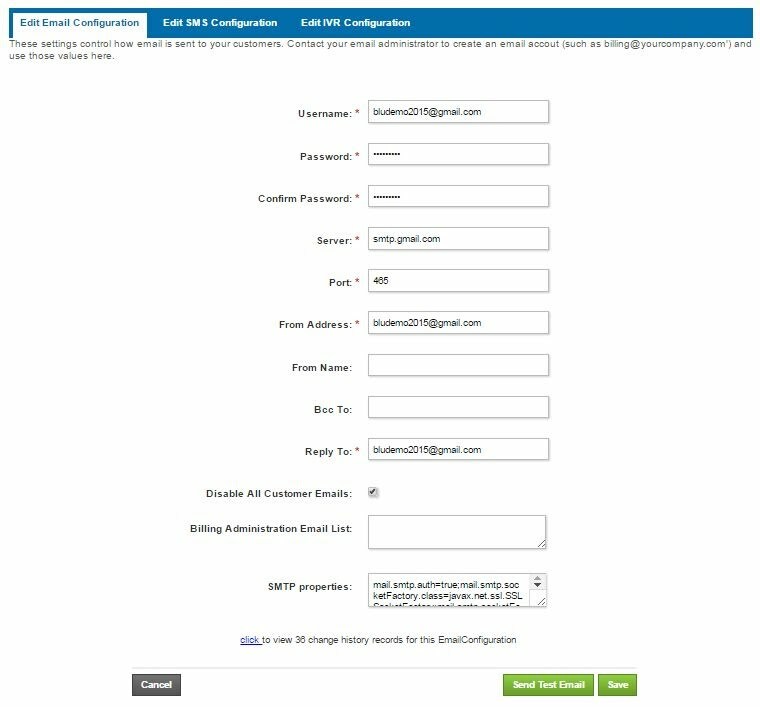 Contact your email administrator to create an email account (such as billing@yourcompany.com') and use those values here. Port: Enter the outgoing mail port number here. For eg: Gmail uses 465 or 25 as the outgoing mail port number. Disable All Customer mails: This field when ticked will disable all mails sent to your customers. Billing Administration Email List: This field can have email ids to which you can have all mails sent from the system to be sent to these mail ids as well. SMTP Properties: This fields needs to have the smtp properties entered without which no mails will be sent from the system. We suggest you to get in touch with your system admin for these details. Fig 1.2.2 shows the test email message.